Florida residents can save 15% and spend their next vacation at Galleria Palms Hotel and take advantage of the Florida Resident Rate Offer. Enjoy a 15% savings on your next stay and discover all that Florida has to offer. 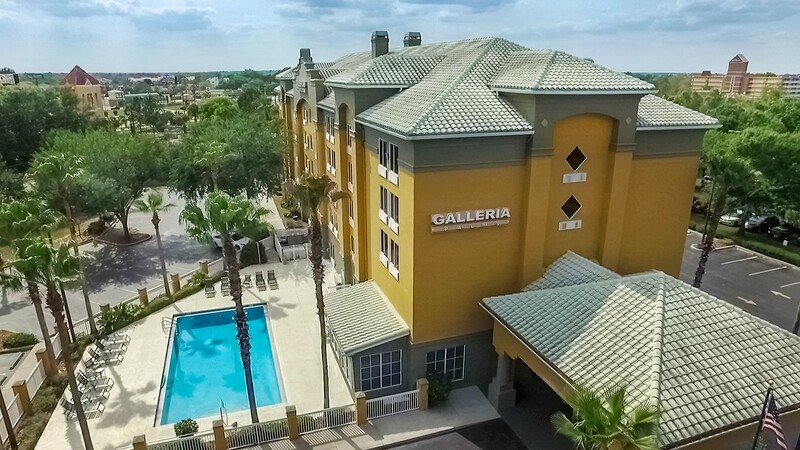 From the thrills of world-famous theme parks, to the excitement of the Orlando-area attractions, Galleria Palms Hotel is conveniently located just minutes away from it all. Call (407) 396-6300 and refer to the special Florida Resident Rate Offer code FLRR.Offer subject to availability. Discount does not include applicable state tax or daily resort fee of $9.99 plus tax. Florida residents save even more during your next vacation with these great exclusives! Walt Disney World Resort – save on multi-day passes.Learn more. SeaWorld Orlando and Discovery Cove – save when purchasing tickets online. Learn more. Universal Orlando – save up to $40 per ticket by purchasing online. Learn more. Airboat Adventures and More – receive a 15% discount. For more information, call (407) 860-1157. Popcorn! Peauts! The sounds and smells of Spring is in the air! Watch the Atlanta Braves play at nearby ESPN Wide World of Sports and save 10%! Rate is valid from 2/14/17-3/27/17. Call 407-396-6300 and refer to our Spring Training Discount, or make your reservations online, to start planning your refreshing vacation today! *Offer subject to availability. Discount does not include applicable state tax or daily resort fee of $9.99 plus tax. We understand the importance of a relaxing and affordable vacation, and we want you to get the utmost value out of your stay with us! That’s why our hotel deals include a 10% discount on guest rooms for AAA members. In addition, you’ll be just minutes from some of the area’s best golf courses and shopping destinations. Call 407-396-6300 and refer to our AAA Discount, or make your reservations online, to start planning your refreshing vacation today! We understand the importance of a relaxing and affordable vacation, and we want you to get the utmost value out of your stay with us! That’s why our hotel deals include a 10% discount on guest rooms for AARP members. In addition, you’ll be just minutes from some of the area’s best golf courses and shopping destinations. Call 407-396-6300 and refer to our AARP Discount, or make your reservations online, to start planning your refreshing vacation today! Galleria Palms would like to thank teachers with a 15% discount for all you do. To show our appreciation, we invite you to take advantage of our Teacher Appreciate Rate and save 15% on your next stay. Plus, enjoy all the thrills and excitement that Orlando has to offer. Call (407) 396-6300 and refer to the special Teacher Appreciation Rate Offer code TEACH. Offer subject to availability. Discount does not include applicable state tax or daily $9.99 resort fee. Stay at our hotel in Florida and save even more with these special offers! - SeaWorld Orlando thanks teachers by offering unlimited admission. Learn more. Wet ‘n Wild invites teachers to enjoy SPLASHtacular savings! Download and print their promotion flyer for presentation at the gate. Teachers will have free admission for the months of September and October if they bring their Teacher ID card, as well as a valid ID. To inquire about discount tickets for teachers, please visit their site and use the password: schoolbroadway. Teachers enjoy free 12-Month Educator Passes to Kennedy Space Center! For details, call (321) 867-4090. At the Galleria Palms, we commend the brave men and women of the military for all they’ve done to serve our country. And as a thank-you for their noble service, the Galleria Palms is proud to extend an exclusive offer to these exceptional individuals! Whether you’re an active or retired member of the military, enjoy a 15% discounted rate on your hotel room* during your stay at Galleria Palms. Turn a weekend of leave into an exciting and memorable family vacation in the heart of sunny Central Florida. Bring your family, visit the world-famous theme parks, and create memories that will last a lifetime. *Valid military ID required at check-in. For more information about our exclusive Orlando hotel deal, contact our front desk staff at (407) 396-6300 today! Offer subject to availability. Discount does not include applicable state tax or daily resort fee of $9.99 plus tax. Located just minutes from Disney’s Maingate, our Kissimmee hotel invites you to experience the magic of dreams brought to life! Spend time creating lasting memories at one of the nearby Walt Disney World® theme parks. As a guest of our exceptionally appointed Galleria Palms Hotel, you’ll love staying less than five miles from all the excitement at the ESPN Wide World of Sports Complex! This renowned Walt Disney World® facility hosts more than 200 amateur and professional sporting events each year, providing athletes with the ultimate stage to showcase their talents. When you make your way to Universal Studios Florida®, you’ll get a behind-the-scenes look at your favorite movies. The theme parks rides and shows will make you feel like you’re in the middle of all the action. When visiting, be sure to save time to explore the exhilarating thrill rides at Universal Orlando Resort’s Islands of Adventure® and sample the diverse dining, nightlife and entertainment at CityWalk®. A new waterpark, Volcano Bay at Universal Orlando Resort, is scheduled to splash down in 2017. When you stay at Galleria Palms Hotel, you’ll be just minutes from undersea animal encounters, live shows that splash, thrilling rides and more! Hop on our complimentary scheduled shuttle to SeaWorld® Orlando and enjoy one of Central Florida’s most popular theme parks. Calling all thrill seekers, car enthusiasts and families with children of all ages – prepare for plenty of action-packed excitement and family-friendly activities near our Galleria Palms Kissimmee hotel! Located just minutes from our property, Fun Spot America Kissimmee and Old Town both offer a variety of entertainment options to suit groups of all ages. It combines the sights and sounds of the biblical world in a unique and interactive way, unlike any other location! To appreciate the many things there are to do at The Holy Land Experience, you will want to plan to spend one to two full days with us. This award-winning course designed by Robert Trent Jones provides the ultimate play in a natural Florida landscape. The club also offers dining at Windmill Restaurant, a golf academy and more. If you’re looking for a challenge nearby, try this 7,000-yard course designed by Rees Jones. This Kissimmee golf course is just minutes from our property near Walt Disney World® Resort. With two acclaimed 18-hole courses to choose from, you can’t go wrong at ChampionsGate. Swing away on the links of International Course and tee off on the resort-style National Course. Travel approximately 30 minutes west for a round at Eagle Creek, offering a 7,198-yard, par-73 course. The course is ideal for golfers of all experience levels, because each hole offers five sets of tees. The boardwalk-style streets of Old Town are home to a shopping emporium with more than 75 specialty shops, such as Kandlestix, Old Town Leather, Old Town General Store, the Pearl Factory and much more! Currently undergoing an ambitious expansion, Disney Springs features 4 distinct neighborhoods―The Landing, Marketplace, West Side and Town Center—built around bubbling springs. Disney Springs is a themed retail, dining and entertainment center inspired by Florida's charming waterfront towns, historic architecture and natural beauty. With over 150 different stores, restaurants and entertainment venues planned, Disney Springs is one of the most exciting destinations of its kind in Central Florida. With more than 50 outlet retailers, Lake Buena Vista offers diverse options and great deals! Explore these nearby stores on your next Kissimmee vacation. Save big on more than 150 brands at Orlando Premium Outlets – Vineland Ave. Featuring stores like Burberry, Coach, Lacoste, Nike, Prada and Tommy Hilfiger, this shopping venue is one you won’t want to miss! Choose Pointe Orlando for a diverse collection of more than 40 open-air specialty shops, delicious restaurants and nightly entertainment. Our hotel in Kissimmee is conveniently situated nearby, making it easy to have an unforgettable shopping experience. Take a piece of Orlando home with you by grabbing some merchandise from the Hard Rock Café, Jimmy Buffett, NBA and NASCAR restaurants. It’s easy to find the perfect souvenir gifts or latest fashions while shopping at Universal CityWalk! Enjoy the best in retail therapy at Orlando Premium Outlets – International Drive, with more than 180 outlet stores, including Cole Haan, Polo Ralph Lauren, Michael Kors and more! With more than 260 stores, Central Florida’s largest mall has something for everyone! Plan a shopping spree and find all your favorites, from Sears and Saks Fifth Avenue, to Nordstrom and Zara! Known for treating guests to an upscale experience with breathtaking architecture, convenient valet parking and international shipping options for guest purchases, the Mall at Millenia provides a luxurious shopping experience for all during your Kissimmee vacation! Near Everything You need, WDW. Great stay for little cost! Outstanding "Nice hotel Cerca de todo"
Good hotel, close to disney parks! Spend a magical vacation at Galleria Palmsl. Just moments from all the best attractions, shopping and golfing destinations — including Walt Disney World® Resort, SeaWorld® and Universal Studios Florida® —we match the perfect location with modern amenities and fresh, bright and comfortable guest rooms. Best of all, you won’t have to worry about transportation and parking — our complimentary shuttle takes you to and from the theme parks. After a day of adventure, come home to a spacious, relaxing room, full of contemporary conveniences, including a 49” flat-panel TV with HBO, soft bedding and pillow-top mattresses and a microwave. Stock your mini fridge with your favorite snacks and drinks and stay connected with complimentary Wi-Fi. Galleria Palms offers resort-style amenities for the entire family! Spend sunny days swimming or lounging by our outdoor heated swimming pool, and fuel up each morning with our deluxe hot continental breakfast buffet! AND.....unlike some of our large competitors, we offer FREE parking!! !